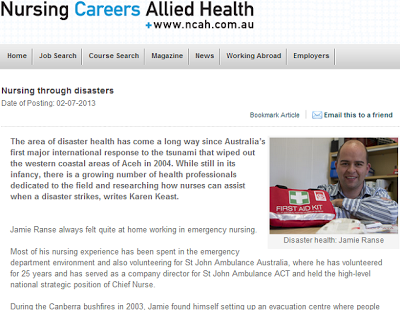 I was interviewed by Karen Keast of Style My Words for Nursing Careers Allied Health. This interview and subsequent article discussed much of my work relating to disaster nursing in Australia. In particular it focuses on the need for all nurses to have some awareness of disasters, and their potential roles in a disaster.